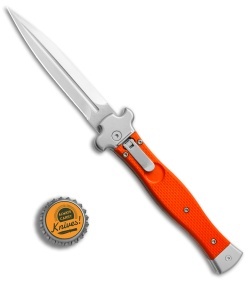 This Zero model features an orange G-10 handle and a stonewashed dagger blade. The AGA Campolin Zero automatic offers Italian-made craftsmanship at it's very finest. 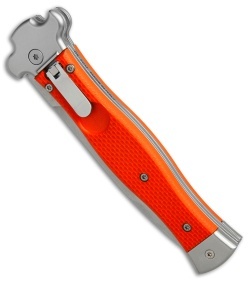 This model is characterized by a flawless fit and finish, rock solid blade lock up, and snappy automatic deployment. 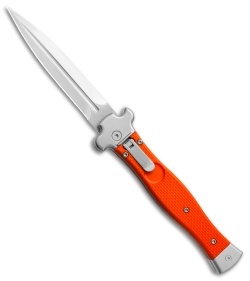 The Zero is definitely not your grandpa's Italian stiletto, with grippy G-10 handle scales, stainless steel bolsters, and a high performance N690Co steel blade. A stainless steel tip-down pocket clip finishes off the solid EDC design. 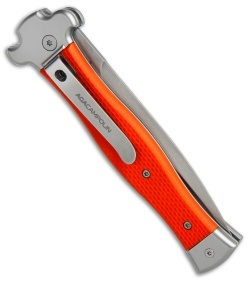 Textured G-10 handle scales offer a secure, high-performance grip.